Our local sister organization’s program manager Ryan Joson visited the disaster-hit areas in Cebu, the Philippines, three times so far: The first time in last December, the second in February, and the recent visit was in April. In his most recent trip, he went in the area to oversee the receipt of the donation of water from Second Harvest Japan. 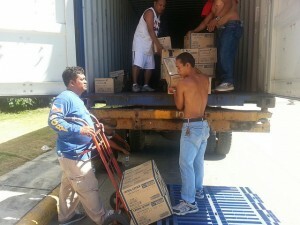 The water donations were shipped from Japan to the Cebu Provincial Government. The building Cebu International Convention Center. The building was damaged by the earthquake that hit Cebu and Bohol before the typhoon hit the area. Inside the building, workers pile up the boxes of water. These will be distributed among the disaster victim in the area. This is a photo from the first shipment from Second Harvest Japan to the area. Second Harvest Japan Chair Charles McJilton and Ryan Joson went to the area to receive the goods. Second Harvest Japan is still planning to send more aid goods to the area. We thank all the people who made this possible.